This morning I struggled to get my body to the gym and easily had 10 reasons why I needed to skip my workout and stay in bed. Almost all of the reasons related to the work piled up on my credenza and some to the comfort of my pillow. The part of my brain that looks out for “Vickie’s well-being” finally pushed me out of bed and out the door with a promise that I could take it easy once I got to the gym. 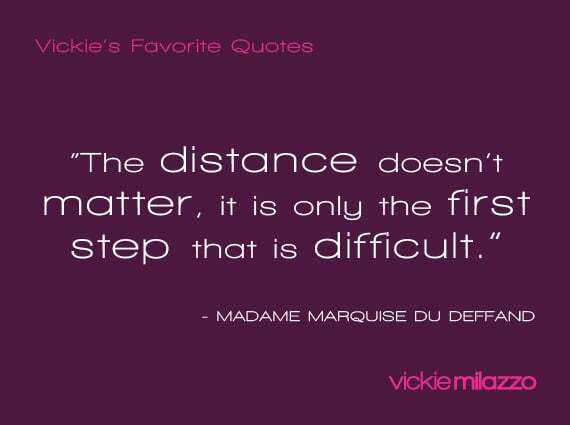 It only took the first set of squats to remind me of my favorite quote by Madame Marquise du Deffand, “The distance doesn’t matter, it is only the first step that is difficult.” Successful people know that once you take the first step, the rest of the distance is easy in comparison. I’ve learned to give myself a nudge or even a push when necessary to get started on that very thing I’m resisting the most. The action is always so much more satisfying and fruitful than the resistance. Trust me, the distance won’t matter after you take that first step. P.S. Comment and share how you nudge yourself to take those necessary first steps in your legal nurse consulting business.